I’ve been very busy recently working on the fine details in the Origins artwork and the upcoming campaign. A lot to cover – from researching historical cards through various archives and museums, to promotional videos, to how much shipping will cost for the variety of shapes and sizes I have planned. But in the process I’ve had the pleasure of sending out my first batch of limited edition prints, and now have an online store for the site. I hope that the store will soon be packed full of high quality goodies but I’m christening it with the early release of the art sets. There are only 80 sets total, 40 on white gloss stock, and 40 on premium quality recycled art stock, all hand signed and numbered. Each set comes in a handmade folder, also signed. 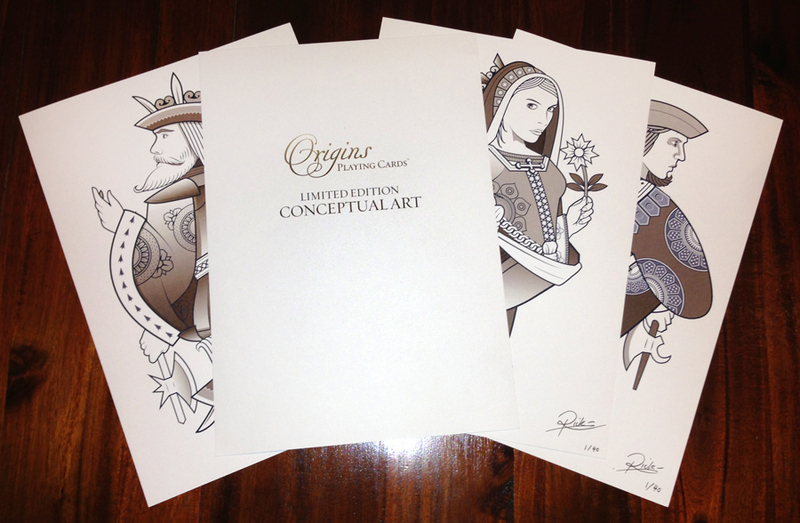 Proceeds will help me with the promotional push and launch of the Origins card campaign.